KOWA Prepares Pan-Asian Garden for Fashion Industry. The famous asian restaurant is preparing its luxurious outdoor space for the fashion industry this coming week. As the first Asian courtyard in the city, equipped with a tranquil oasis and ancient Chinese gardens, personnel flying into Milan for Men's Fashion Week will be looking for a restorative and reinvigorating experience. "We place special emphasis on our user experience, cultivating an outdoor ancient Asian garden ambience that cannot be located anywhere else in Milan," said Andrea Reitano, Founder and Owner of KOWA. "Offering some of Milan's best cocktails and pan-Asian cuisine, we are opening our doors to the incredible people that will comprise the world-changing Milan Men's Fashion Week." Milan Men's Fashion Week will begin on June 15th and complete on June 18th. Shows and runway by Marni, Neil Barrett, Versace, Marcelo Burlon, MSGM, Prada, Dsquared2, Isabel Benenato, Giorgio Armani, Fendi, Frankie Morello, Philipp Plein and more will be taking place during the 4-day event. Following London Men's Fashion Week earlier this month, fashion magazines are reporting a love-affair with street style, athleisure-wear, and fanny-packs to grace the Milan runways later this week. Drawing on media, designs, fashion icons, models, make-up artists, and videographers from around the world, it wants the Fashion Week pioneers to consider their open-air classy dining by day, and forbidden nighttime garden enchantment by night. "Our secret garden is synonymous with luxury, bold design, and daring accents, making it a must-see attraction for everyone gracing Milan today," said Reitano. "We welcome Milan's guests with Men's Fashion Week." KOWA's garden is open from April thru October, seating up to 60-people. One of Milan's most sought-after outside destinations when compared to the Mandarin Oriental Milan's Seta Restaurant, Bulgari Hotel's courtyards, and Salumaio di Montenapoleone, the pan-Asian entity is working hard to prepare the garden for the kick-off of Milan Men's Fashion Week. 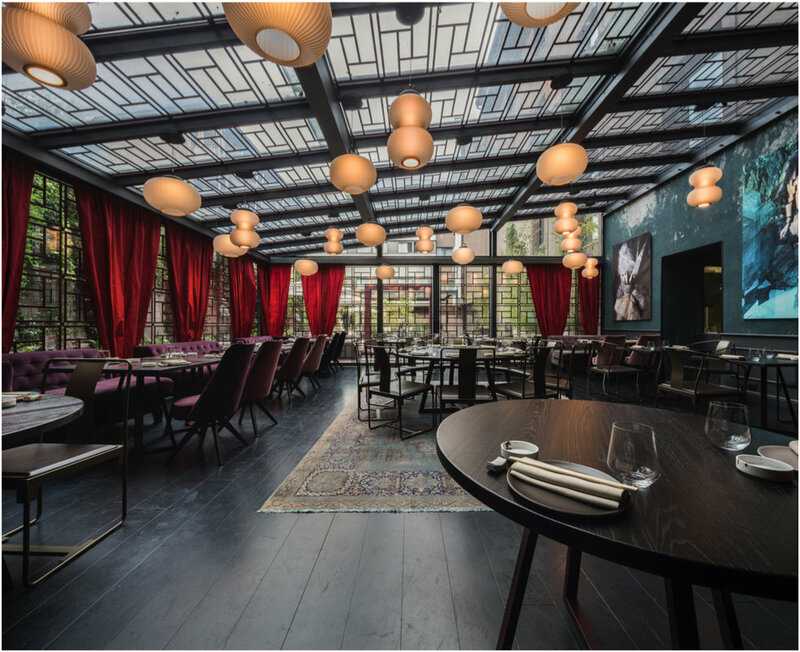 The restaurant officially opened their doors earlier this year ahead of Salone del Mobile, when over 1.6 million people descended on Italy for an international design event. Ideated by Andrea Reitano, a character known for his keen eye for detail and ability to scout the best talent in the industry, KOWA is led by Executive Chef, Jeff Tyler, who has worked in pan-Asian kitchens around the world. Since then, they have served celebrities, politicians, fashion icons, and up-and-coming entrepreneurs in one of the world's most notably regarded fashion capitals. Yes, Mom, you read that right. Mother's day is a day of celebration- and a day which is approaching rather quickly. As we reflect on this day many memories can come to mind; the first time we watched her put on makeup, the first bra she bought us (and how traumatic it was learning to put it on), helping us nurse what we felt was the biggest heartbreak ever, and we could never forget those goodnight kisses right before bed. As I began to write, I thought of the great memories my mom and I have had. It was as if the ages of 13-17 were washed from my memory with relation to good memories with mom. Then it hit me, those were the teen years where I decided that my mom was just the lady who gave birth to me (and not in a good way). OK, I'm being a little dramatic. I would still tell her I loved her before we hung up the phone, and appreciate the yummy dinners she cooked. But I was nothing short of a bratty teenager. I can recall being in what felt like constant trouble, sneaking behind her back and doing something she didn't want, and rolling my eyes at her so much it actually would give me a headache. I think back to scribbling makeup on my face at school because she wouldn't let me wear it, and telling her that she was the worst and I hated her. Just like the movies that break your heart just a little. I dwell on these memories and I wanted nothing more than to call my mom apologizing 4 years too late, but then I realized that I have no reason to be sorry. If it weren't for these memories, I wouldn't have the relationship that I do with my mother now. I know you hear people call their mother their best friend- well mine isn't. Instead shes the phone call I make to calm me down after I bomb a test, she's the stylist I go to when I need some recommendations on a good statement necklace, she's the 50 text messages I send when I'm trying a new recipe and the smoke alarm has gone off 3 times already, she's the shoulder that I cuddle up to when I'm so glad to be home after what feels like an eternity. She wouldn't be this to me if she didn't endure the awfulness I gave her in my younger years. Because despite the yelling, the crying, and the groans of frustration- she never failed to assure me that she loves me. My mother has seen me at, what I hope will be, my worst. And never let me forget that she loves me. This took a while for me to understand why, but it allowed me to be more open with her. Instead of sneaking around her with something I knew she wouldn't like, I found out it was better coming from me right away instead of her finding out later (because I have no idea how, but she always found things out). She has always told me that her favorite thing about me was that I'm not afraid to be myself, so why was I hiding that from her? Being open with my mom allowed me to reintroduce myself to her, that unapologetic self that she always told me was her favorite. It allowed us to reconnect and be able to build this new relationship from the old foundation. We just had to clear a few weeds to find it. So, Mom, I don't regret being the reason for your headaches through those years. But I do regret not telling you that I loved you back every chance I got Thank you for always sticking by me up to this point, and for telling me how proud of me you are. I know that it can't be easy having a teenager but you did it flawlessly and I'm so glad I hit the lottery getting you as my mom. I love you & Happy Mother's Day.